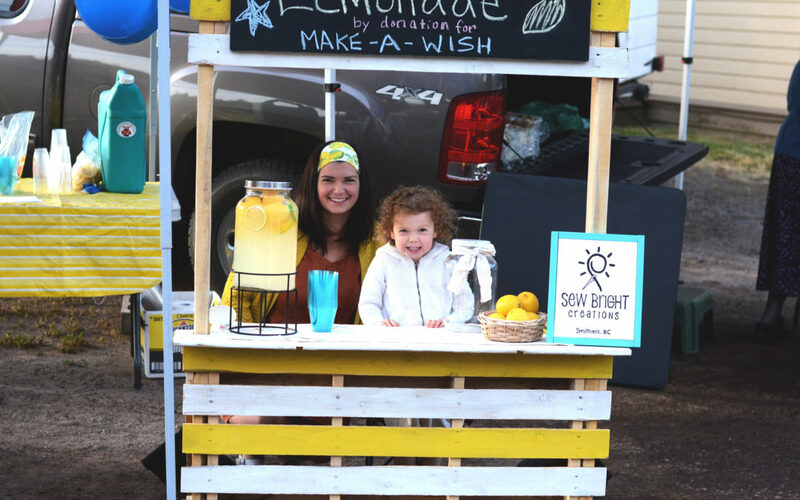 We had so much fun at our Lemonade for Wishes fundraiser yesterday, I already can’t wait to do it again! A grand total of $761.91 was raised for Make-A-Wish BC & Yukon!! This was our second year doing it, you can read about last year’s fundraiser here. Last year our goal was $250 and we raised $500. This year our goal was $500 and we surpassed that raising over $700. I am hoping we can raise over $1000 next year!!! 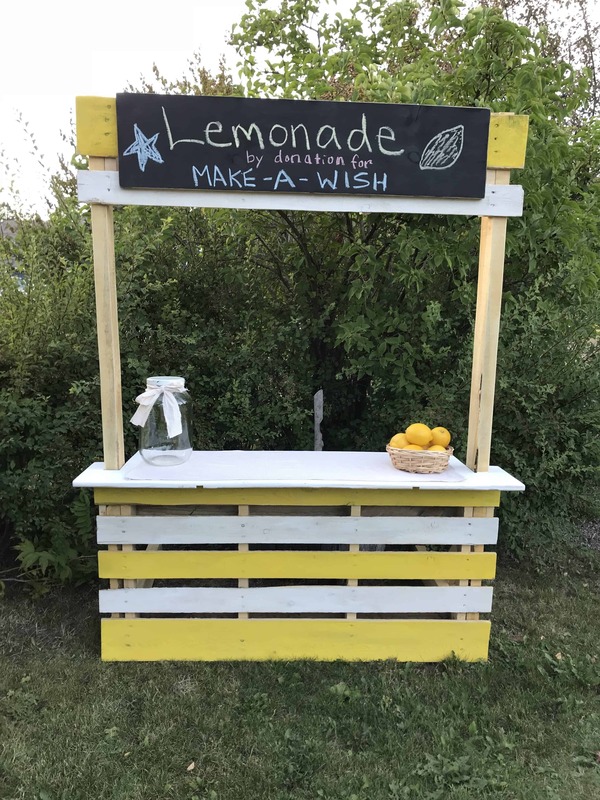 Last year we were living in Saskatchewan when we did the fundraiser and the Saskatchewan Make-A-Wish Foundation has an official Lemonade for Wishes campaign. 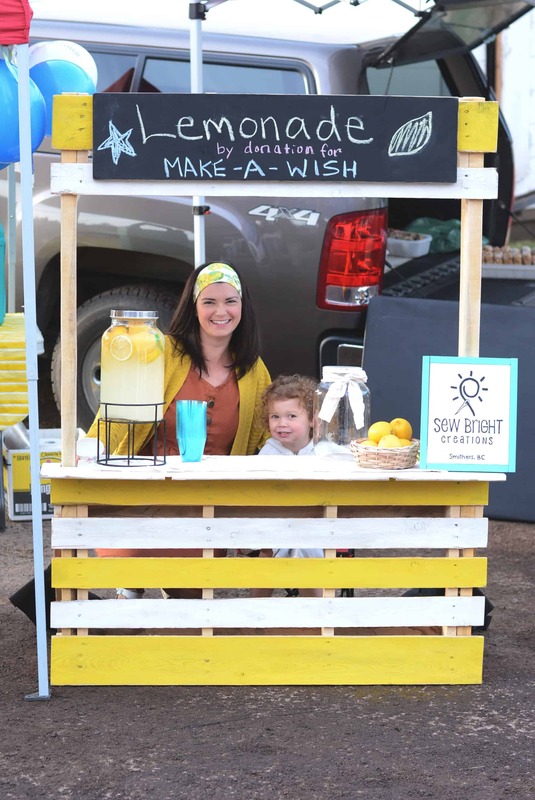 Make-A-Wish supplies the lemonade and cups and then all proceeds raised from the lemonade stand goes to Make-A-Wish. 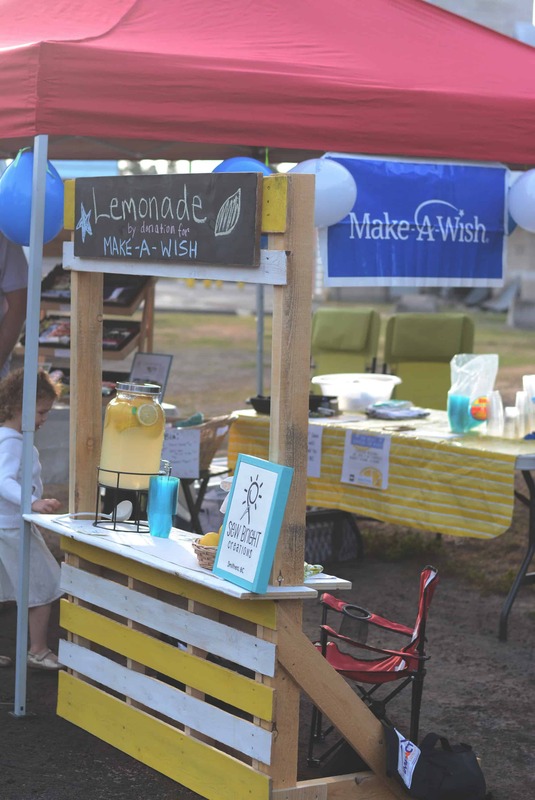 We are now in BC and although Make-A-Wish does not have an official Lemonade for Wishes campaign here, they still sent us some stickers, banners and balloons and donation forms to make our Lemonade stand an official Make-A-Wish fundraiser. We set up our stand at the Bulkley Valley Farmer’s Market in Smithers and had such a great turn out! I even donated $50 from Sew Bright sales at the market. A lot of people have asked us what our connection is to Make-A-Wish. We really don’t have a specific connection, but I just love what the organization does. If you are not familar, Make-A-Wish grants wishes to children with life threatening illnesses. You can read more about the amazing work they do on their website. I am also so incredibly blessed to have a healthy daughter, however I know that that could change in an instant. While we are healthy, I am honoured to be able to support such a great cause. This year was particularly special for me because my family was there to help. The circumstances are unfortunate as they are here because they have been evacuated due to the Nadina Lake Wildfire. They have been under a ton of stress lately and I was really happy to have them with us and have something to take their mind off all the chaos and devastation from the fires. Even if it was only for a few hours, it was just nice to be doing something fun together. The thing that really topped it off for me was meeting two Make-A-Wish families! I was almost crying, I couldn’t believe it. Both families were so sweet and it just made me so happy to know that what we are doing really does make a difference, in the tiny little way that we can help. 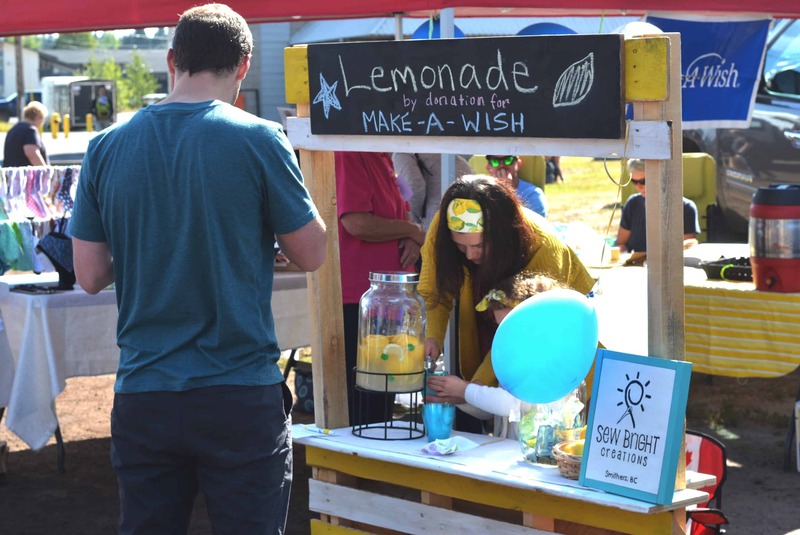 Last year our lemonade stand was made out of a cardboard box, but it did not make the cut for moving so we had to start from scratch this year! My brother and husband helped built this years stand out of a pallet! Within a few hours we had a pretty awesome lemonade stand that I think will last many more years! 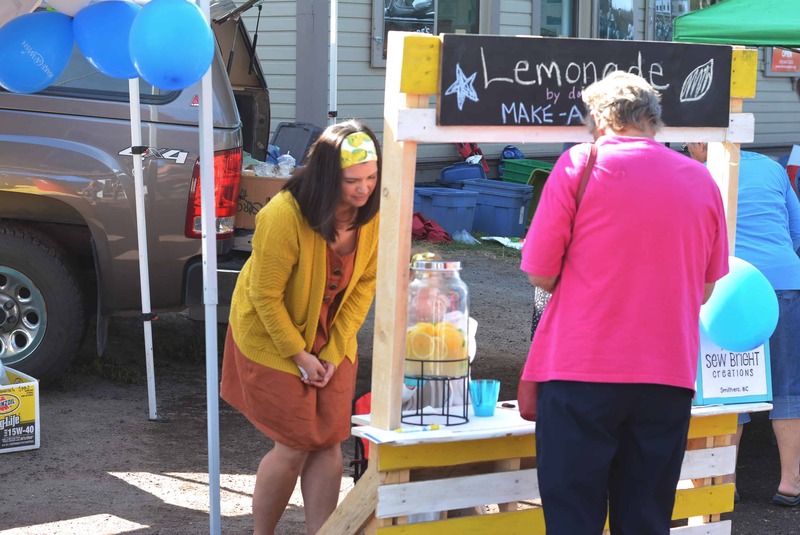 A huge THANK YOU to the Bulkley Valley Farmer’s Market for allowing us to host our lemonade stand at the market, Smithers Interior News for sharing our story (click HERE to read it), my brother and husband for helping build the lemonade stand, my other brother, husband and parents for helping the day of and for ALL of you who donated and shopped Sew Bright Creations. And my daughter, maybe one day she will read this. She made me so proud. She carefully poured each cup of lemonade (lots on her own) and she didn’t spill any!! There were many that were close, but she did so well.